The Adams Family Halloween Homicide! Join in the fun with us at the Whitewater Hotel this Halloween! Enjoy a fantastic night out with the Adams family at the stylish Riverside Restaurant. The Adams Family Halloween Homicide – It’s Halloween once again and the highlight of the Adams Family’s year. The celebrations are in full swing but someone is about to lose more than their party spirit. Will Morticia get her pumpkins out? Will Gomez grapple with the ghoulies? Will Uncle Fester stop festering? Will daughter Wednesday make it to the weekend? 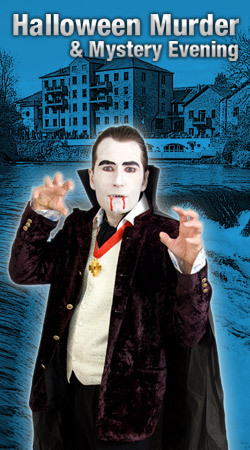 And why is Count Dracula hanging around? You are all invited to the Halloween hop but can you solve the morbid murder before the witching hour? Why not book a weekend break or a night away and enjoy a hearty, Cumbrian breakfast and some relaxation at the fabulous new cascades spa. Why not book in for Sunday lunch the next day too? We are offering a shockingly good Halloween getaway with prices starting from £99 per couple bed and breakfast per night or £129 dbb! The Whitewater Hotel is the perfect retreat to get in the Halloween Spirit! Contact reservations for room rates and pamper packages, or simply follow this link to book a room directly!